I saw Krishna and his bandaged mouth, at the medical ward of the Ram Manohar Lohia hospital in Delhi. Thin intravenous tubes were connected to his hand and another pipe was at his mouth. His dutiful wife, Sangeetha sat by his side. She had been my domestic help for the past 4 years. And, the bond between us had grown beyond a mere employer- employee relationship, sharing daily tidbit of each others lives. With three little kids to feed and educate, Krishna worked as a rickshaw puller on Ajmal Khan Road, and Sangeetha worked in two more residences in our colony. Whether it was the staunch smell of the tincture, or the sight of Krishna’s disfigured face, I simply do not know. Five minutes in the ward and a dizzy feeling crept through me. I quickly gripped a chair and sat down. Sangeetha was inconsolable. The cancer was malignant, prompting the doctors to cut off the lesion stricken portion of Krishna’s tongue. As the oncologist walked in, Sangeetha looked up, searching for some hope in the doctor’s face. “He is fine now, and could be discharged soon,” the doctor said. As he walked out, I followed him to understand Krishna’s state. “The disease is progressive he said. We would use the traditional ways of chemotherapy and maybe radiation if required… but….” I understood from his trailing voice… there wasn’t much hope after all. In the United States alone, tobacco use accounts for at least 30% of all cancer deaths, causing 87% of lung cancer deaths in men, and 70% of lung cancer deaths in women. (Source: Cancer Facts & Figures 2014). Tobacco use is the leading preventable cause of death in the United States. 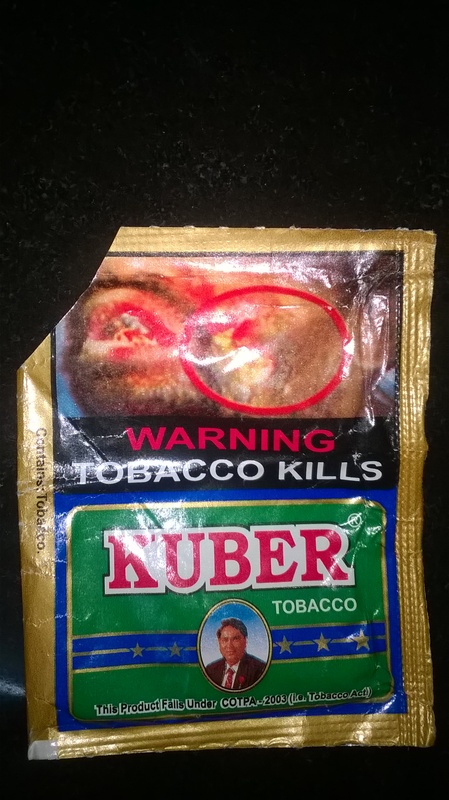 So you are at risk if you regularly chew gutka, paan, zarda, paan masala and any other form of chewable tobacco. A cigarette, cigar or a beedi is no better. Here are some hard hitting facts. The risk of oral cancer is about 5 to 10 times greater among smokers compared to people who never smoked. This risk is further multiplied among smokers who also drink alcohol. Smokers are at higher risk of dying from oral cancer than those who have never smoked. The risk of dying from oral cancer increases with the amount smoked per day. In Delhi state alone more than a lakh of people consume some form of tobacco. Tiny packets are available in most “chai” shops around the street. For people like Krishna, consumption of chewable tobacco gives them the much needed vigor to endure a day’s hard labor. Despite the warning on the packet, little did Krishna realize its consequences. The malignancy caused by chewing tobacco eventually took Krishna’s life away. The Delhi government has called for a ban of the sale of chewable tobacco products in the state. This is yet to be formally enforced as the Delhi High Court on April 8,2015 had restrained it from taking any coercive action against a manufacturer who had appealed against the ban following which the ban notification was revised. I personally feel such a ban is a much needed thing for the well being of the people, if it is coupled with large scale campaigns to educate the masses on the harmful effects of chewable tobacco. It would save many more lives. It would save many more families from losing their loved one. My husband is a smoker and he just won’t quit. I worry about what he’s doing to his body, but I didn’t even consider mouth cancer as a possibility. Oh gosh! I am hardly a drop in this blogging ocean 😀 Thank you so much for the love, Ramya. It was a pleasure to read your post 🙂 Glad you linked it up with Yeah Write. One of the best places on the Web for writers. I echo Laurel’s word. I am so damn proud of myself. Yesterday was the weed day in the USA. Youngsters were hurdled everywhere lost in their world, calling it a chilled day. if only they knew how ‘chilled’ they will become in the future. 🙁 Great theme. I’m very thankful I never took up smoking – it really is such a terribly harmful practice. Thanks for this informative post. True Laurel… The harmful effects of tobacco are still not adequately spoken about.